Xerox Corporation : Designed to print crisply and smoothly from the first page to the last. Handles even the toughest workloads with ease. No more mess -- installs quickly and easily for less downtime. 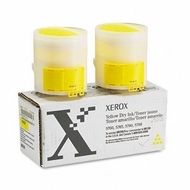 Supply Type: Laser Cartridge; Color(s): Yellow; Device Types: Laser Printer; Ink Yield: N\A. : Includes two magenta cartridges, each yielding 24,000 pages.